Woke up early at 5:00 a.m. Waiting for the innkeeper to turn on the solar geyser so that we can take bath in warm water before we get going. This is going to be the last bath at least for next five days. We need to get used to our body odors and of those around us. May the force be with us. There is a sense here about ecological sustainability. Electricity is used to a minimum, water is conserved, waste is minimized. The solar geyser only gets the water warm enough to take bath and that too in measured quantity — so you take a bath and not a shower. You think about the next person who needs to use the facility, you take as little as you can and try to leave the rest. Everyone gathered around the terrace cabin for breakfast. There was a lot of food being served, the spirits were high, eagerness and energy was flowing all around, we all knew we are going to make memories for life. All of us gathered outside the inn for our group photograph. With smiles all over and heartful of excitement everyone gets moving. The first few hundred meters are all about getting to the extremity of the Sankri village. Suddenly, on our right, we see a mountain path leading way up, off the tar road a green enclave. And the muscles start to realize they are here for some serious workout. We all slowly get into rhythm. The first thirty minutes everyone experiments with their pace and place in the pack. Within an hour everyone knows how they stack up. While the weather is pleasant but on the colder side, we start to feel warm–very warm. Everyone was layered up and slowly we had to remove one layer after another. The trick is to keep the body in motion, working up some sweat and keeping warm. If you remove your layers and pause for a little longer, you will start to feel cold. All the sweat you worked up will start to work against you and your body temperature dips. A beautiful day with the sun nicely glancing down the valley and the pine forest alive with the sounds of nature. We keep climbing up, on goat paths, over muddy mountain trails. Merrily bantering, singing along, enjoying the views, having warm ‘getting to know each other’ conversations. Chanchal and I pace each other nicely. I realize it is hard for me to leave her behind even if it is a hundred steps. 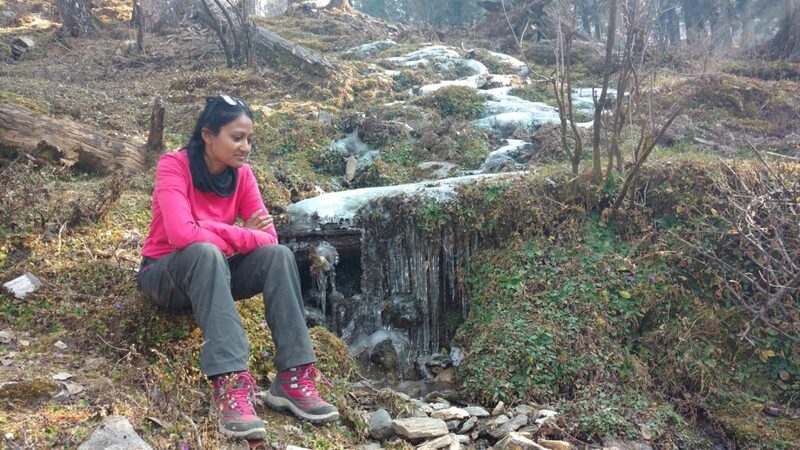 Or let me say it better, I enjoyed trekking beside her. Giving her company, giving unsolicited advice, mostly keeping her engaged and irritating her. What are good husbands for? We thoroughly enjoyed the trek, stopped at a beautiful clearing area for Maggie and omelette. The open meadow and the pantry cabin was straight out of a fairy tale. 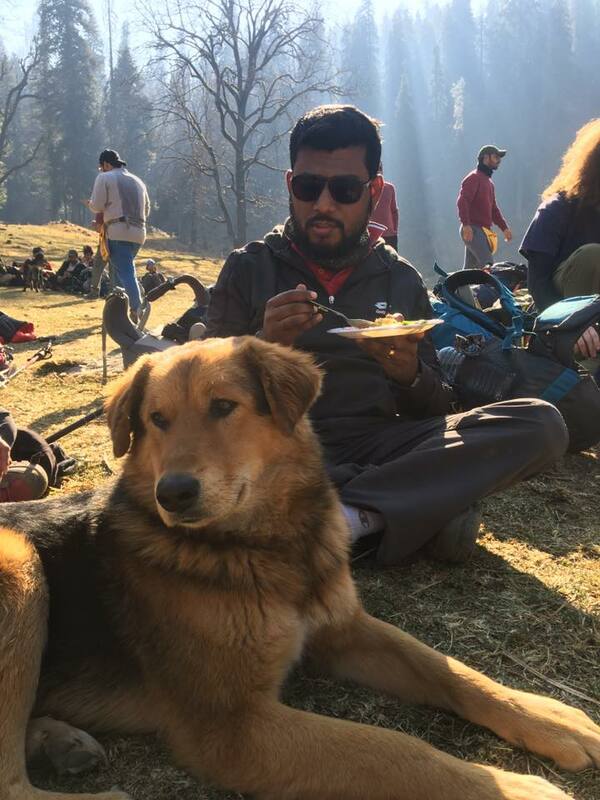 A big beautiful mountain dog was fixated on the omelettes Chanchal was eating and did not budge until she parted with almost half of it. 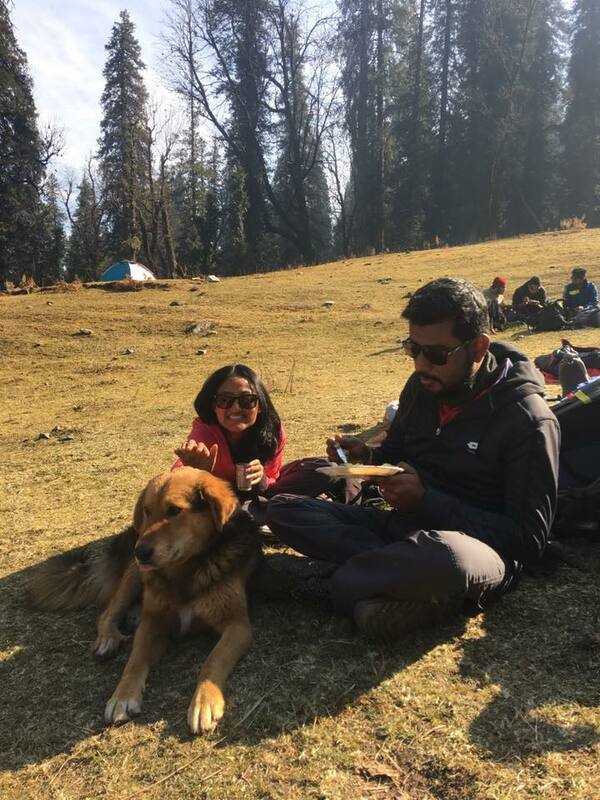 The dog was used to trekkers taking a pit stop here for rest and food. Friendly and engaging, the dog made sure everyone parted with some of their food. He merrily sat next to us and spent a few minutes under the sun. It was sort of a picnic spot, we ate a lot. Chatted with our fellow trekkers, basked in the sun. Our days were filled with gruelling schedules and physical activities. We needed the extra protein. We anyways were having our fistful of nuts – almonds, raisins, walnuts and figs. We trek for six hours and finally reach Juda Ka Talab by afternoon. The place is straight out of a post card. 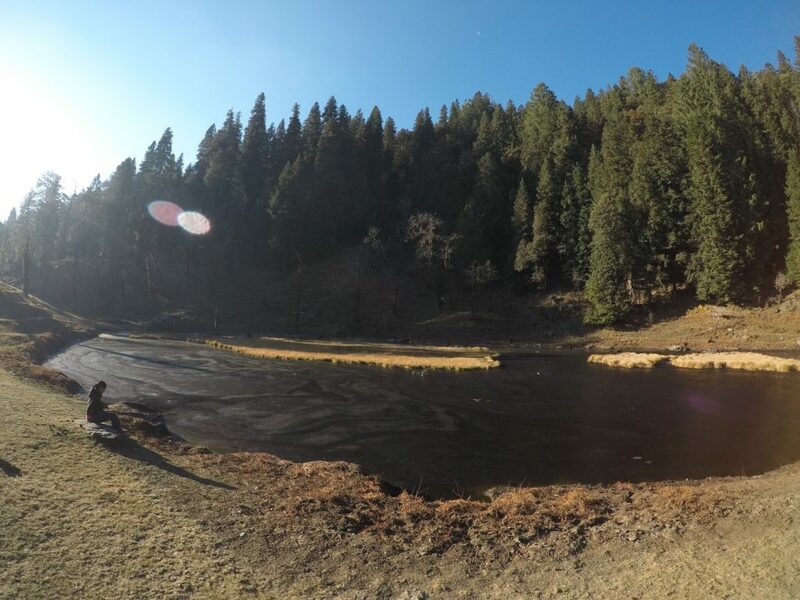 Tall pine trees, majestic Himalayan views, and a charcoal-colored frozen lake by your camp. You cannot ask for more. This is paradise. Peeps, this is as beautiful as it gets. Time almost stands still. You are in the lap of nature. I felt silence in everything. The woods are silent, the frozen lake is silent, people’s faces emit a peculiar silence here. It is all good. It is the good silence. Everyone takes in their quiet moment. Atop a mound, our tents are pitched. 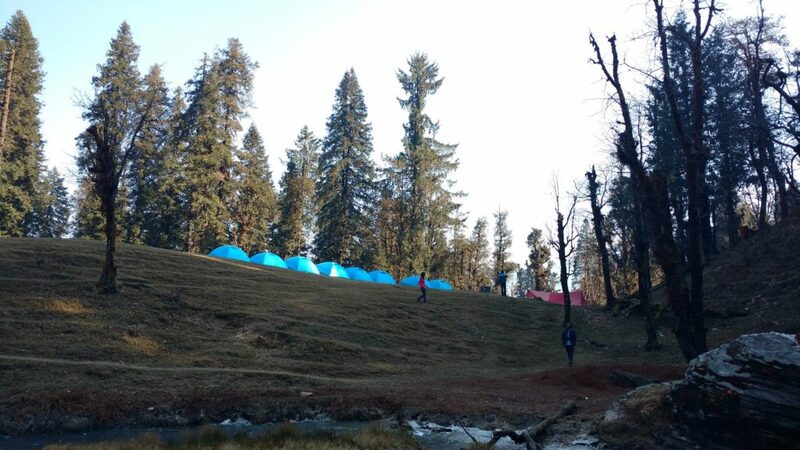 To the left of our tents is Juda Ka Talab. It is rock solid ice. Dark as nothingness and cold as a moonless night. Yet it exudes a certain calmness. We have our lunch in about an hour after reaching Juda Ka Talab. It gets cold very quickly here. The hot lunch is sumptuous and helps everyone connect as a group. When you get to know each other a little better, you also get to know their talents. Anirudh, who lives in Bangalore, is a trained singer and William Palmer (a.k.a Will) is a beat boxer. And man they jam! It was fascinating to observe Will jamming to a old hindi song’s rhythm. Their jamming brought an instant cheer to the group. Music slowly took over and we decided to play antakshari. We were divided into two groups as the practice is and the songs started to flow. I was pleasantly surprised when we realized that Karishma was super awesome when it came to singing songs — hindi (old and new) or english. She knew so many songs. Totally broke the NRI stereotype. Way to go, girl! 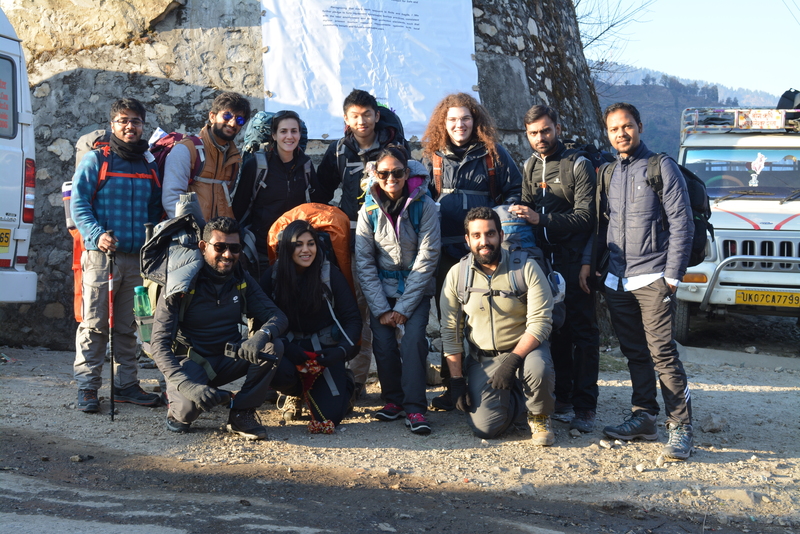 We were told by Abhishek–our Trek Leader–that in about an hour’s time (by 5:00 pm), we will trek up about 100 meters to a higher ground to acclimatize so that we can sleep better at night. We were also to play some games to keep the blood circulation going. Little did we know that we were already turning into five year olds, playing childhood games with total abandon. No mobile phones, no traffic, no meetings or calls, no television. There was nothing but us and the nature. What a fantastic start to our trek. The games tired us down and brought us closer as a group. We returned to our camps for tea to be followed by dinner. The food was awesome. We had our dinner at the dinner tent. It was a much bigger tent for everyone to sit and have food. It was warm and cosy with so many people in that tent. Outside the temperature was dipping fast. One gets frequently reminded that you are by a frozen lake and the night is going to be really cold. 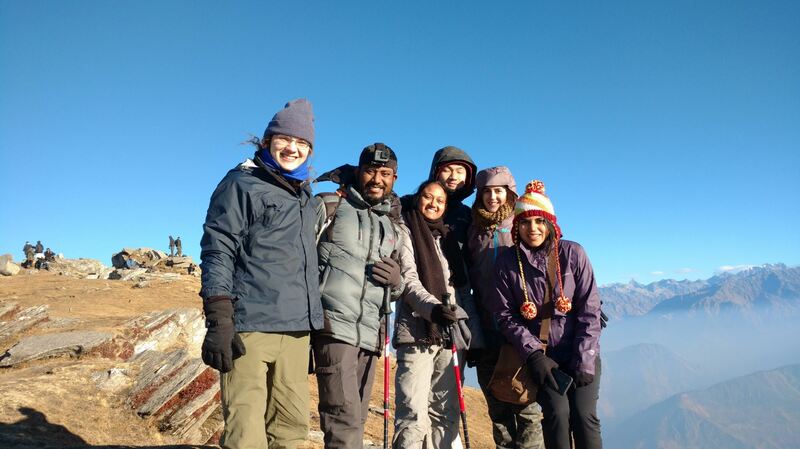 By now, Chanchal and I had bonded well with our four American friends. Personally, I was thrilled to get to know each one of them. Just wonderful human beings. I am not sure who started it. One of them had asked us to share our story, I believe in the cab ride from Dehradun to Sankri on Day 1. The story about how Chanchal and I came together. We had been trying to find the right time and place to share. It seemed like a perfect ‘get holed up in a tent with your torches and share stories’ kinda night. We did just that. Chanchal and I took turns to share our version or memory of how we thought things turned out. We would add our perspective to each other’s versions, often learning something new about how each other thought or felt during a certain phase in our journey. During the storytelling session, I felt that Chanchal was really brave in sharing some of the details–sharing what once pained you without a need for sympathy is a sign of liberation. It is strange to share some of your personal moments with others. 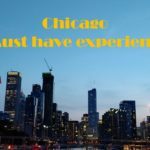 Not too many people have heard it from us. Some have witnessed it. But it is not the same. I was happy that we did share our story. In my view, after that we all bonded even closer. Chanchal and I with the four wonderful friends. There is something liberating and revolutionary about sharing your journey, your misgivings, your vulnerabilities. The night continued, we stepped out of the tent and came out to the clearing and looked up. It was a starry night. As if someone had spray painted white little glistening dots on a black canvas. The biting cold, the utter darkness of the camp site, the frozen lake by your side and emotionally moving conversations– that was what the night was made of. Sussie and Karishma were curious and kept asking our perspective on relationships, identity and knowing when the moment or person is right. I am sure it would have been interesting for them to hear perspectives from diagonally opposite standpoints, which were still in harmony with each other. Chanchal’s and my perspective can seem starkly different yet magically aligned if you take notice. I remember one specific question from the group on rights and wrongs. Chanchal’s response was around doing what seems right from your standpoint, staying true to your convictions, keeping your intentions straight and noble. It was about staying the course and doing the right thing no matter what the odds. A little powerhouse she is. My response to the same question (honestly, I do not remember if they even asked me the question. I just jumped in with my perspective) was on the lines of identity is the culprit. How you define your identity dictates what is right or wrong in any situation. If you identify yourself with only your body then the rights and wrongs will be different — you will do almost anything to maximise the wellbeing of this body and rationalize it as a right. If you expand your identity to include your friends (for instance everyone in this camp), then you will rationalize every action you do to protect and care for this bunch as a righteous one. Even if it meant killing a wild animal that seems to pose a threat to the safety of this group. Suddenly an act of violence takes on a righteous tenor. You can keep expanding this sense of inclusion and at some point you become a patriot defending your country, taken further your defend right of humanity, taken even further your identify with all life form on this planet and then what is right now could become wrong and vice versa. So in my view there is no right or wrong. Only a limited mind has a need to perceive such a binary concept. Karishma mentioned that some people in their wider circle believe they think too much. To this point, I offered my own — if we humans are the dominant and most evolved specie on this planet, there is a reason for it. We thought long and hard for centuries and millennia to be able to be where we are. You have the most evolved brain structure so that we can think. Most animals live out their instincts, we have an intellect and a choice. What good it is if we do not exercise it, challenge it, nurture it and hone it. So think, long and hard. Do it all the time. In our explorations alone rests the future of our specie. The only reason you have such an evolved brain is so that you can think. — Will asked, if he could use this statement back home with people. I said ‘of course’. I didn’t think it was such a powerful statement (pun intended). It was really late. Any later it would be morning. So we decided to retire into our respective tents and agreed to carry on the discussion threads in the days to come. Well getting into the tent, removing your shoes, your jackets and layers is a tedious task in such a confined space – especially when two of you are attempting the same thing. See the thing is you cannot sleep with all the layers on. If you do so, in about thirty minutes your body will start to heat up and you will start to sweat. If that happens, the ride is unpleasant and downhill from there. With sub zero temperatures, your sweat will start to cool down quickly and bring your body temperature to dangerous levels. I had to wake up around 3:00 a.m. to take a leak. Well, it is not as simple as putting on the bedroom light, walking up to the bathroom and szzzzz. Here before you even step out, you have to layer up, find soap or hand sanitizer in the dark, step out and quickly wear your trekking shoes and take a long walk to the toilet tent. If you are in a rush, god save you. It is an adventure unto itself. Chanchal insisted to give me company, so both of us were out in the wilderness, with only our head torches to help us find our path. The night was surreal. It had gotten further cold, there was not even slightest of sound that we could hear. We could actually hear our beating hearts. It was that quiet. After I did what I woke up to do. We both stood in the jungle for a few minutes–absorbing everything. We knew these moments will stay with us for the rest of our lives. 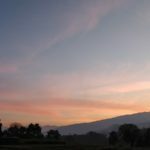 Next day, I was up by 5:45 a.m. and Chanchal was up by 6:00 a.m. Well, brushing your teeth is another adventure. You have to walk to the same spot, near the toilet tents. The water is icy cold, your hand goes numb within seconds. Once, done with that chore, I headed straight for tea and Chanchal to her morning meditation. Commendable how she follows her sadhna even in such trying conditions. After a wonderful breakfast, we were all set to the trek ahead. Today, the trek was supposed to be a relatively short one. About a couple of hours. 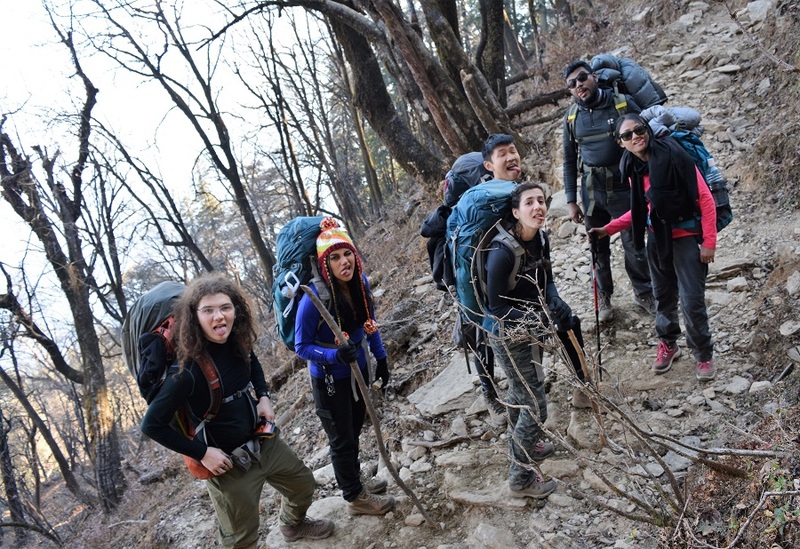 The idea was to reach KedarKantha base camp before lunch. Eat, get plenty of rest, take long walks, sleep early. 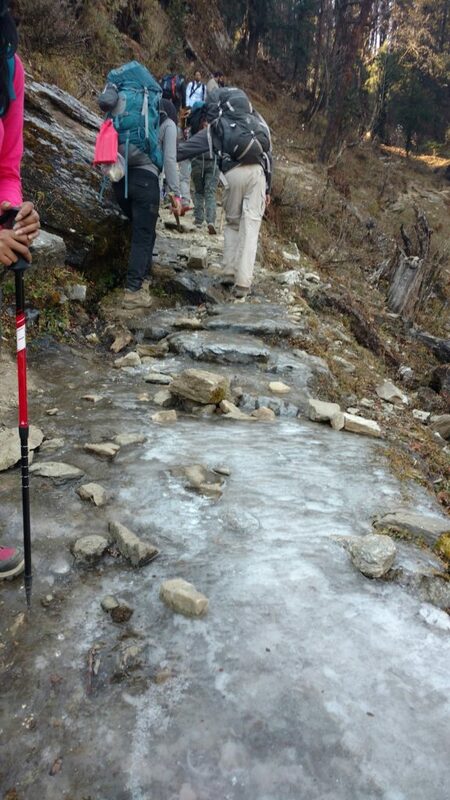 While the trek up to the base camp was shorter, it was by no means just a cake walk. Although some of our fellow trekkers said so. Well, it all boils down to how prepared your body and mind is. One has to be on a trek with amazing company to be able to understand how many meaningful threads of conversations you hold onto and pick-up at a moment’s notice. You strike unique and special equations with everyone. The topics of conversations vary depending upon who you are taking to. One thing is sure, you always learn something new – perspectives, cultural orientation, daily routines, life hacks and approaches, etc. You just have to keep an open mind, be ready to be challenged, eager to take a short walk outside your comfort zone, trust one another and just be in the moment. In the Himalayas, all of this comes very easy. Even to those who are usually uptight with a rod up their you know what. 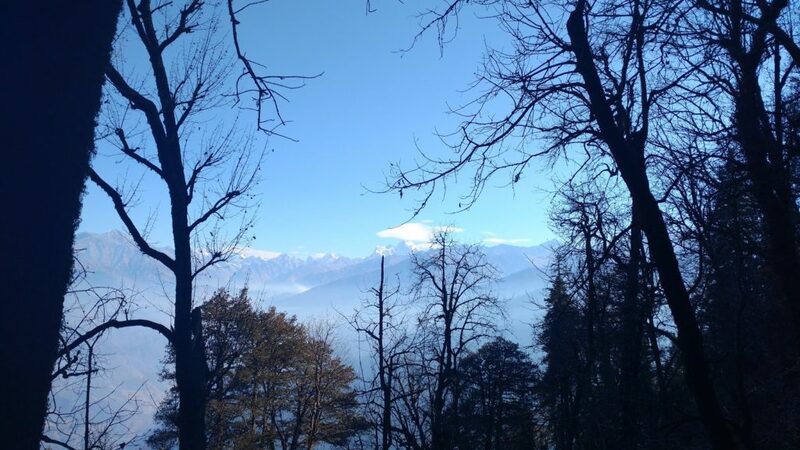 The Himalayas, have this potent ungluing power. It unbinds your conditioning, weakens those structural bonds of routine, habits, conformity and fear. Unless you are keenly aware, you may not notice this phenomenon, yet it happens ever so slowly and then there is this point when you feel elevated, easy and exploratory. 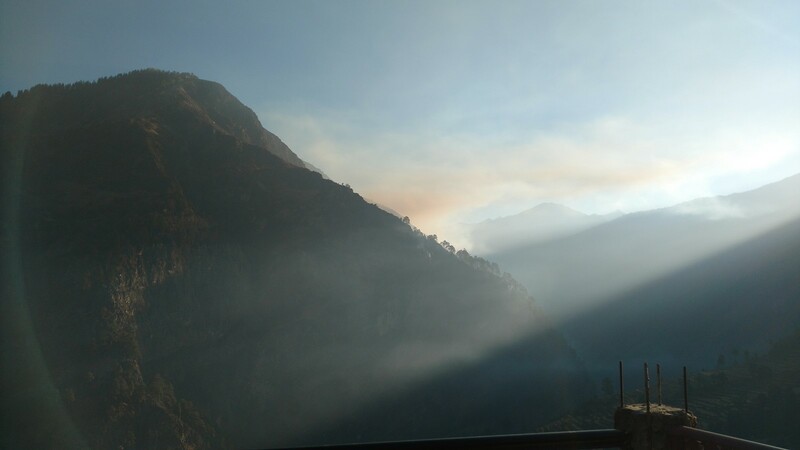 It is the towering power of the Himalayas – it seeps into your blood and bile, finds its way into the sinews, reverberated through your cellular structure, accumulating itself alongside your bone marrow, spilling out through your eyes, rendering you open, joyous, grateful and connected. A peaceful and exhilarating smile is inevitable. 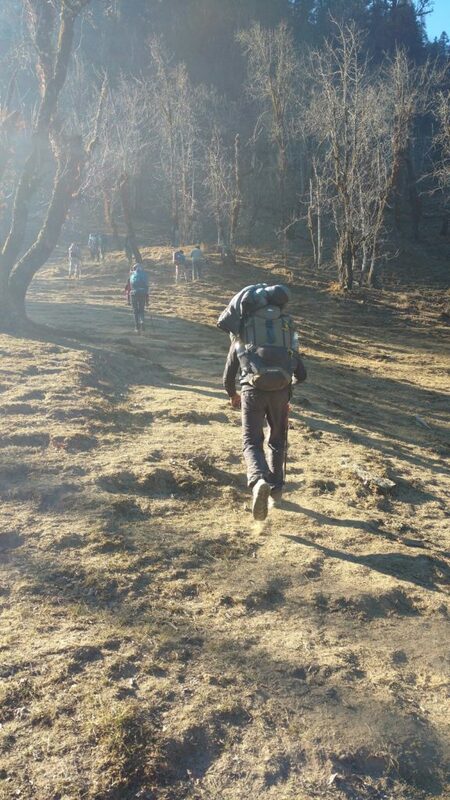 Reached the KedarKantha base camp by about 12:15 p.m. It was an elevated wedge on the mountain, you could merrily tumble down to the small meadow below. 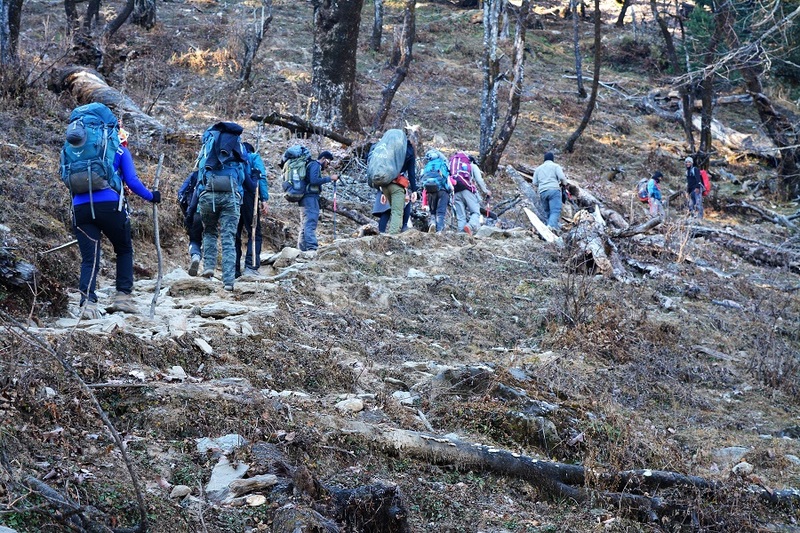 When we reached the base camp, there was a flurry of activity there. 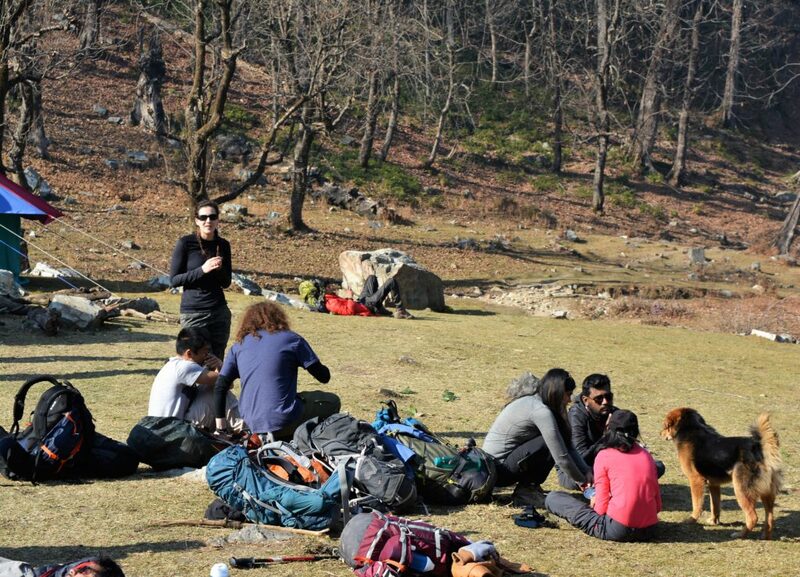 The batch of trekkers who had summited in the morning were coming back for lunch. You could see your entire group in this another batch. As if all trekking groups are a composite organisms. Fun, frolic, deep conversations, each of them sharing their experiences, pulling each other’s legs, developing deep trust. It is remarkable. We picked our tent. Shoved our bags into it and went about exploring the campsite. You keep getting surprised by the beauty of the Himalayan clearings. 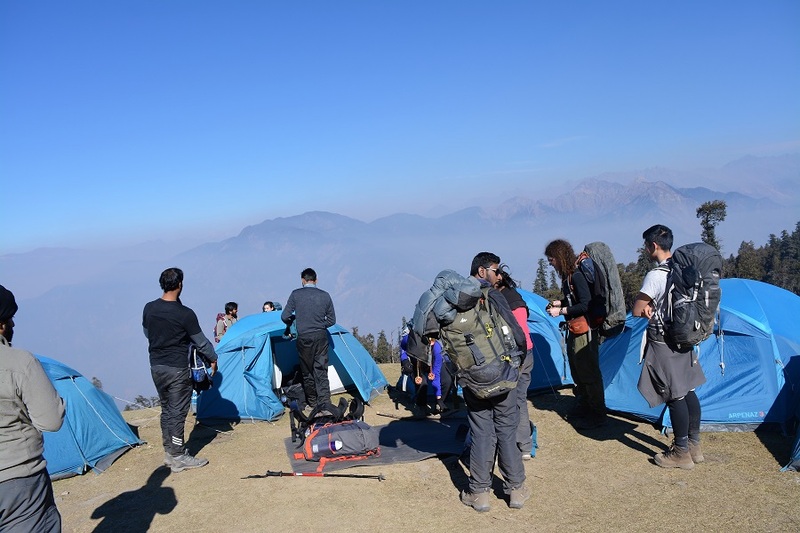 One moment you are trekking on the mountain in deep pine forests and the next you step into a wide open clearing over looking valleys and majestic snow clad mountains. Will had a balanced and objective view on things. Rare to find, especially at an age he was traversing. Well, I should take my words back – age has nothing to do with wisdom or even balance. You have five year olds who are balanced and wise and you have seventy year olds who are out of balance and whack. Eric emerged as someone who was masterful in engaging with all viewpoints, respecting them and putting this whole jigsaw puzzle of world views together. While it often seemed like he was almost too gentle to present and persist with his view point, it was far from being true. I was able to observe how he respectfully was able to retain his individuality and kept doing his own thing. I guess there is an inner Eric who is stable, assured and inert. And there is the Eric for the world, who is welcoming, agreeable, flexible and caring. What a wonderful complement of inner and outer dimensions. Hats off, Mr Bai. After a while, three of us – Chanchal, Suzzie and I decided to take a short walk down the meadows. We walked down, almost dragged down by gravity and had to use our ankle support in our trek shoes to good effect. We strolled into the sparse woods and found a stream that had frozen over. As if we were in a photograph, and the water just froze to pose. The icicles were gorgeous. We could see the entire stream frozen upstream. The birds were chirping, there was so much biodiversity here that you could just feel it. We decided to continue our little adventure into the woods and Suzie decided to head back. Chanchal and I carried on. We chit-chatted about how what we saw, how we felt, the wonderful conversations we had with others in the group. We had no distractions, no mobile phones, emails, whatsapp messages, youtube videos to distract us. We were two people connecting outside the definitions of our spousal relationship. We were discovering hidden aspects of each other. When you are in a discovery mood, everything becomes interesting. Even a rock cut a certain way could inspire a variety of questions, a strange looking mushroom could fire your imagination to build stories of how that fungi came to be. You wonder, if the forest at night starts to move around. Do the trees take a little walk, get some circulation going, meet some of their old friends from the other side of the woods, take vacations like we do, pick up old or new fights with other trees, do they mourn the loss of a loved one quietly in the night, do they discipline the young ones into growing straight and tall? You ask all these questions. You are lucky if you have a partner who engages in such questioning with you. The logical side of you think it knows the answer but a part of you is truly curious – What if? We continued our little trek and encountered a rivulet which was now frozen and you could actually cross over to the side over the sheet of ice. It was like the rivulet, the sun and the wind were playing a game of statue – and someone pointed at the stream and said in a sharp, sudden voice ‘Statue’. After a while, when our curiosity and sense of discovery and adventure gave way to hunger, we started walking back towards the base camp. Lunch was ready and the gang had merrily stretched themselves out in the clearing to bask in the afternoon sun. We had our lunch and I was heavy with sleep. Retiring into the blue tent was magical. Sleep came over in minutes. I must have slept for an hour and a half. When I woke up it was about 4:30 p.m. I felt well rested and at ease. Chanchal was already out talking with others. 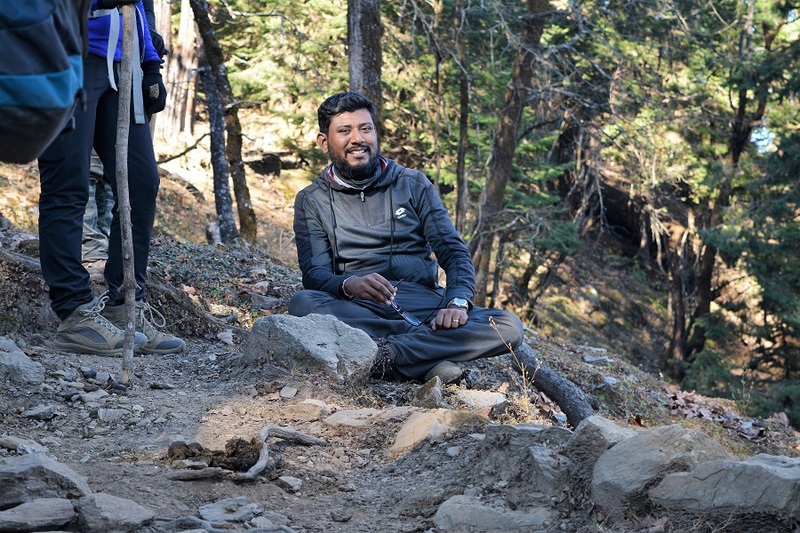 Abhishek our trek leader was getting ready to make a wooden knife for Karishma. His dedication was commendable. 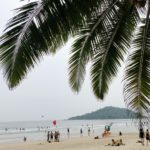 He borrowed a big knife from the pantry tent and started chipping away at the small log of wood – until a rough shape of a knife started to emerge. He kept at it until the knife was ready and he could gift it to an eagerly waiting Karishma. You could almost sense a little emotional yearning develop and take shape. By the time, the knife was ready it started to get dark. After rounds of soup and tea. It was time for an early dinner and sleep. Next day was summit day. We had to start our trek to the summit really early at 3:30 a.m. And we had a long and arduous day ahead of us. The day everyone had signed up for. 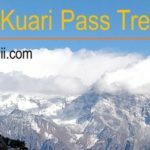 Summiting the majestic KedarKantha peak at 12,500 feet. We borrowed some hand warmer sachets from Karishma. 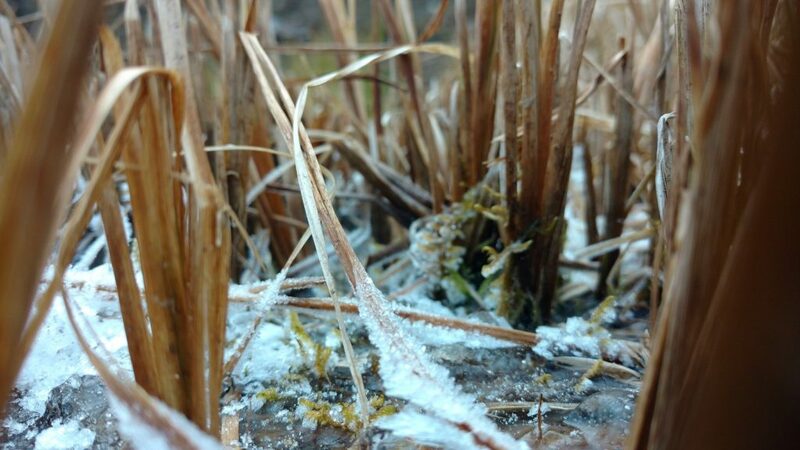 The temperature was minus two and was expected to further dip through the night. I had a rough night. I sweated profusely in the initial hour or so and didn’t realize until my body started to get cold. I woke up with a shiver and had to change my layers head to toe to give myself any chance of summiting. I could not bring myself to sleep there after. I felt claustrophobic in the sleeping bag with my body and face covered. I felt the biting cold when I opened the flap of the sleeping bag to avoid claustrophobia. In those moments, the night gets to you, the cold, the silence of a mountain, the fact that in a few hours you need to be climbing up a steep and narrow ridge to summit. The odds suddenly stack up against you in your mind as you deal with a night that does not seem to pass. You are awake, every second lets you know when it passes and it seems in no hurry. There is a general sense of panic and restlessness within you. You know this is your mind playing tricks on you and you try to fight it as hard as you can. Well, somehow the night passes. At least whatever was left of it before we had to get ready to leave on our final ascent. We were to leave sharp at 3:30 a.m. after having tea and breakfast.